Mornings can be tricky! If you don’t start off right, you can throw your whole day off! 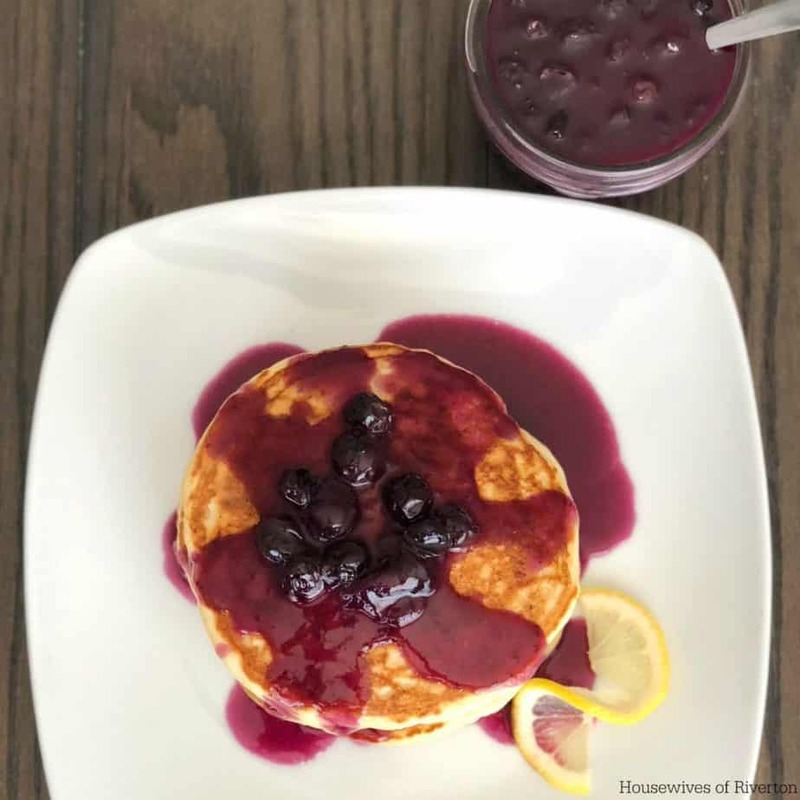 Enjoy these tasty Lemon Ricotta Pancakes with Blueberry Compote to make your morning extra spectacular! Pancakes are a pretty big deal in our house! We love to try different kinds and pick our favorites. 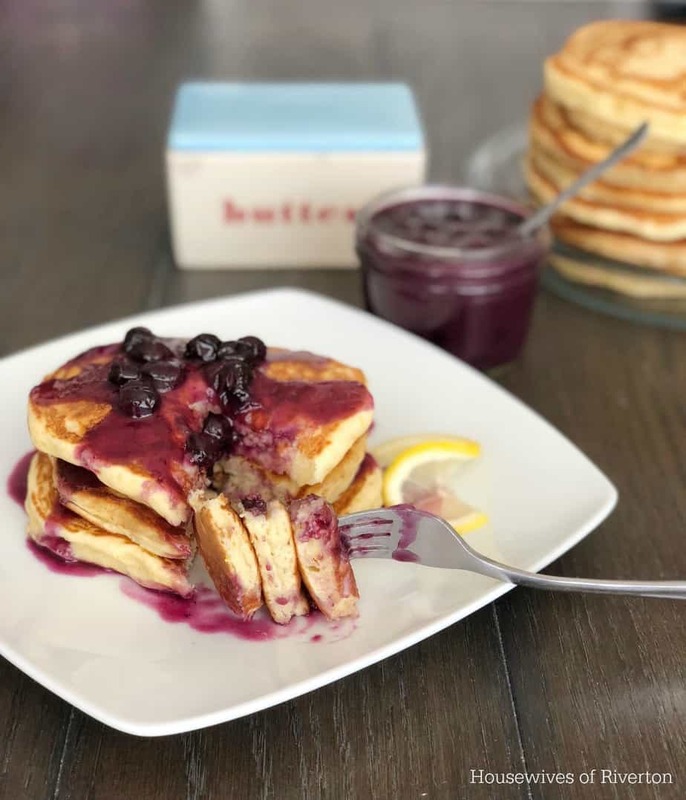 Of course these Ricotta Pancakes with Blueberry Compote have landed themselves at the top of our list! This recipe comes together quickly and easily, creating a fluffy, hearty pancake. Send your family off for the day with a belly full of deliciousness! You’ll want to get started on the blueberry compote first. In a small sauce pan, add water, sugar and blueberries over medium heat. Let that come to a soft boil, stirring occasionally. Next add your butter, let that melt and stir occasionally. In a small bowl or cup, whisk together your heavy cream and cornstarch, stir that into your blueberry mixture. Let simmer, uncovered, while you prepare you pancakes. Lets get going on our pancake batter! In a small bowl, whisk together the ricotta cheese, lemon juice, lemon zest, vanilla, eggs, and milk. In a large bowl, whisk together the flour, sugar, salt, baking powder, baking soda. Combine your wet mixture to your dry mixture, make sure you don’t over mix. This batter will be thicker than you are probably used to. Heat your skillet or griddle over medium heat, I use butter in my skillet to cook the pancakes, a nonstick spray will also work. Using a 1/4 cup scoop, pour onto your skillet or griddle and cook until the pancakes has bubbles, usually a minute or two. Flip and cook for another couple of minutes until golden brown. Top with the blueberry compote and enjoy! **Now a few tips/notes. These pancakes are thick and hearty. 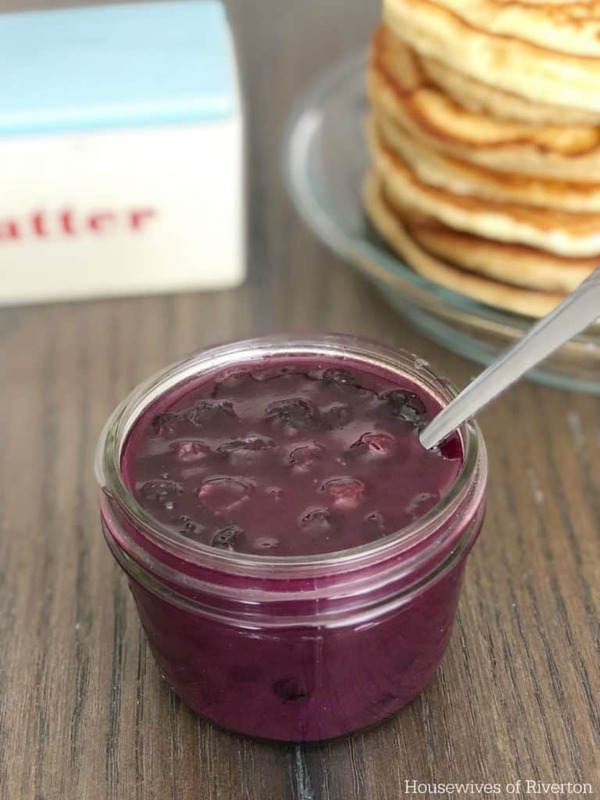 The lemon flavor is very mild when you are eating the pancake alone, but when you add the blueberry compote, the blueberry flavor amplifies the lemon flavor making it the perfect combination. If you are looking to make mornings easier, you can premake these pancakes and freeze them. I just put a piece of wax paper between each one so they don’t stick together, toss them in a gallon size zip bag and pull them out as needed! Feel free to try throw some variety in your pancake schedule and give our Carrot Cake and Cinnamon Buttermilk Pancakes a try! Mornings can be tricky! If you don't start off right, you can throw your whole day off! 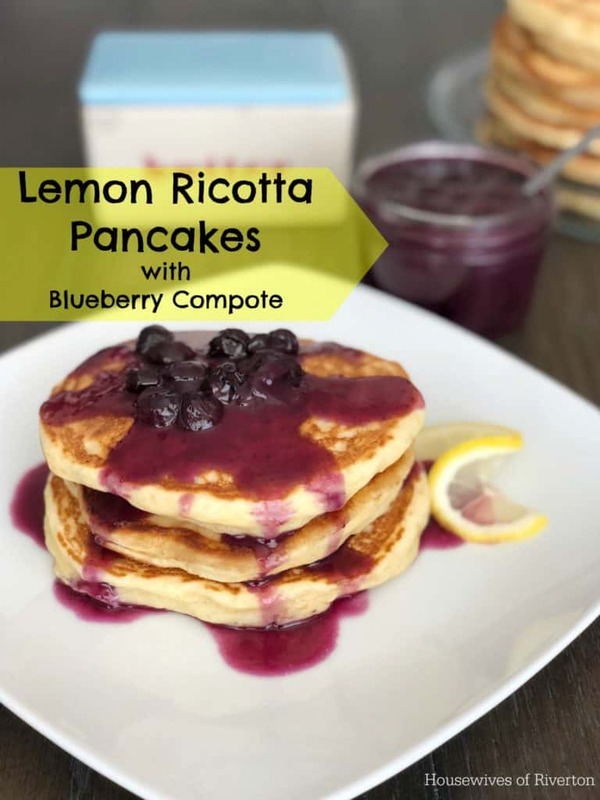 Enjoy these tasty Lemon Ricotta Pancakes with Blueberry Compote to make your morning extra spectacular! In a large bowl, whisk together the flour, sugar, salt, baking powder, baking soda. Combine your wet mixture to your dry mixture, make sure you don't over mix. This batter will be thicker than you are probably used to. In a small sauce pan, add water, sugar and blueberries over medium heat. Let that come to a soft boil, stirring occasionally. Add your butter, let that melt and stir occasionally. In a small bowl or cup, whisk together your heavy cream and cornstarch. Stir cornstarch mixture into your blueberry mixture.